[Aspen, Colorado] Only one week into the tour and I realized my thimbles had taken on a form of their own. 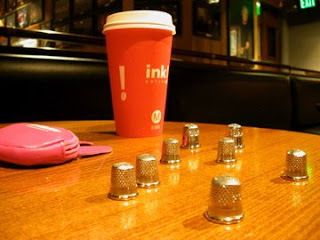 This resulted in a frantic quest for replacement thimbles at all the drugstores in Aspen. Unfortunately, all I could find were zinc thimbles which are not as comfortable/malleable as the aluminum ones I usually use. Oh well. But I did find a jump rope.